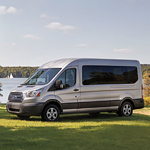 How Many Different Body Configurations are Available in the Ford Transit Passenger Wagon? Most car manufacturers limit the size differential of its product to one possibility in each line. Many of these vehicles come in several trims so that the model is attractive to a diverse clientele. The purpose of this practice is to limit the effect of product diversification on the assembly line process. Today, Ford is jumping into a different mode of operation by offering the Transit Passenger Wagon in various lengths, heights, and wheelbase. To accommodate the different needs of families and businesses, Ford offers the Transit Passenger Wagon in three lengths: Standard, Long wheelbase, and Long wheelbase extended. The standard size is perfect for carrying up to eight occupants, while the long and extended carries up to 12 and 15 passengers respectively. At Sternberg Automotive Group, we demonstrate the difference between the wheelbases with models to accommodate your family and business needs.